Hey are you looking for a new high quality protective travel backpacks and camera bag? Recently we were at Lowepro's New Multifunctional Lifestyle Bags For Travellers and Photographers launch in conjunction with the brand 50th Anniversary celebration at Isetan KLCC. Known and also the world’s trusted leader for its high-quality protective backpacks, cases and camera bags, Lowepro unveiled their 4 new multifunctional lifestyle bags collections which consist of Campus+, Urban+, Matrix+ and Travel+ comprising of 18 modern designs in Malaysia recently. These are the improved designs and functionalities for different needs. Catered for lifestyle and photography enthusiasts the newly launched eye-catching collections – Campus+, Urban+, Matrix+ and Travel+, arrive in various forms such as backpacks, messenger bags, totes, shoulder bags as well as klettersack backpacks to suit the ever-changing needs of users. 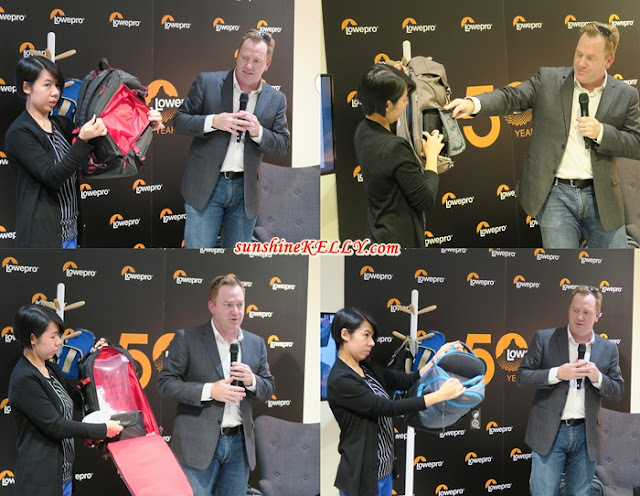 Mr Kevin Crandall, Product Development & Manufacturing Senior Director of Lowepro were here to present the new bag collection and also its functionalities. The Matrix+ backpacks are excellent choice for both work and play. It’s very sleek and contemporary perfect for working and urbanites like us. Transition from work to workout in a jiffy with the Matrix+ collection, this everyday bag with a remarkably polished design features a detachable camera case and is able to fit a 15-inch laptop in its back panel compartment for added protection. Aside from having a water-resistant finish, it is also incorporated with spacious side pockets to store items such as water bottle and towels. For ardent travellers that required high-performance backpacks that are able to withstand harsh environs with its innovative technology the Travel+ collection will be a good companion. This collection provides a robust finish and is fitted with radio-frequency identification (RFID) blocking side pockets for improved security and safety. It also has compartments to keep our valuebles safe and prevent theft. Built for long-lasting durability, this sleek water-resistant backpack ensures the wearers enjoy countless adventures without compromising comfort with its ergonomic shoulder straps. The Urban+ Collection is cool and features customizable partitions for photography with ergonomically designs and comfort. This collection also has shoulder plus tote bag that perfect for the feminine type. Urban+ is an innovative collection for photography aficionados who are looking for adjustable compartments in a gear. Perfect for mirrorless and small DLSR cameras, this collection comes with five different types of bags with plenty of storage for personal items. The Campus+ Collection caters for young thrill-seekers. The backpacks are trendy, stylish and highly functional. With its lightweight and water-repellent features, it is undoubtedly a perfect companion for outdoor adventures. Available in three striking colours, its spacious compartment equipped with zipped pocket allows users to store small personal items such as sunglasses and keys. Wel each collection ~ Campus+, Urban+, Matrix+ and Travel+, has its own charms. Overall Lowepro bag is designed to protect our gears and personal belongings at the same time providing the versatility, durability and comfort. Lowepro bags are now available at Isetan Malaysia. And Isetan members get to enjoy the limited-time offer of 10% off all the newly launched Lowepro bags until 9 July, 2017. Apart from Isetan KLCC, the collections are also exclusively available in Isetan KLCC, Isetan 1 Utama and Isetan The Gardens for a week until 12 July 2017. The collections will be made available in selected retail outlets thereafter. Nice bag is essential items for traveller. I love their collections. How time flies - they are 50 years old already but still top of the game when it comes to bags. I can only dream of owning one. Looks good. I need a good bag too. Will keep this in my mind. Cool cool bag! I saw this on your IG and now good to read about it in detail on your blog.